Inter forward Mauro Icardi scored with a stoppage time header to give his side a dramatic 1-0 win over neighbours AC Milan in their derby at San Siro on Sunday. 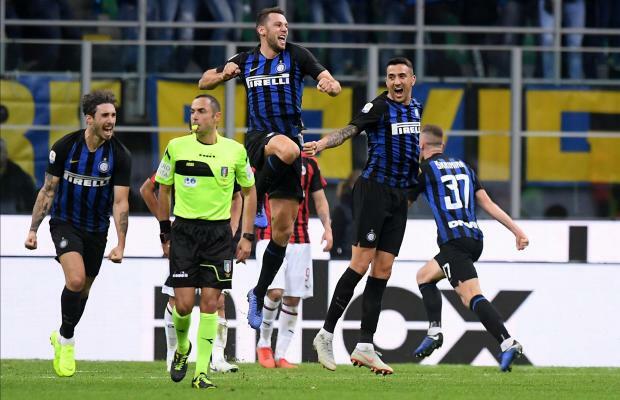 The match was heading for a tame goalless draw until Matias Vecino floated over a long cross from the right, Milan goalkeeper Gianluigi Donnarumma was caught in no man's land and Icardi scored at the far post in the 92nd minute. Icardi had a early goal chalked off and Mateo Musacchio had one disallowed for Milan just before halftime, both for offside. Inter went third in Serie A with 19 points from nine games while Milan are 12th with 12 points, having played a game less. Earlier, former Italy coach Gian Piero Ventura suffered an unhappy return to football on Sunday as his new side Chievo were hammered 5-1 at home by Atalanta in Serie A, leaving them rooted to the bottom of the table. Ventura replaced Lorenzo D'Anna earlier this month and it was the first time the 70-year-old had sat on the bench since Italy's 0-0 draw at home to Sweden last November which resulted in them missing the World Cup for the first time in 60 years. Josip Ilicic scored a hat-trick between the 28th and 52nd minutes for Atalanta after Marten de Roon had given them a 25th minute lead. Robin Gosens completed the rout and Valter Birsa's late penalty was scant consolation for Chievo who are winless and have minus one point from nine games after having had three deducted for accounting irregularities. To compound a miserable day for Ventura, Chievo also had Federico Barba sent off for a second bookable offence in the 40th minute.